Illuminate your home with Charlotte Willis’s guide to making your own non-toxic, vegan-friendly candles. If you don’t want to make your own take a look at our pick of the best vegan candles you can buy here. Think all candles were created equally? Think again. Believe it or not, many a common candle you buy on the high street is likely to contain non-vegan ingredients including beeswax, tallow (animal fat), paraffin (toxic when burnt) and palm oil (not the most sustainable of oils). Follow this guide to making completely vegan, non-toxic candles and your home will smell delightful yet your conscience will be clear! Whether you love twinkling tea lights or chunky pillar candles, there’s nothing that soothes the soul more than shunning artificial light in favour of a beautiful, natural, orange flickering-glow. But how many of us have considered the vegan suitability and, indeed, the safety, of the candles we have in our homes? Conventional candles, unless otherwise stated, are often made using potentially toxic ingredients. Paraffin wax is one such nasty, yet extremely common, ingredient used in traditional and cheaper candle-making processes. When burned, paraffin contributes to indoor air pollution. You’ll be inhaling small doses of benzene and toluene, which are both known carcinogens found in the exhausts of diesel engines! 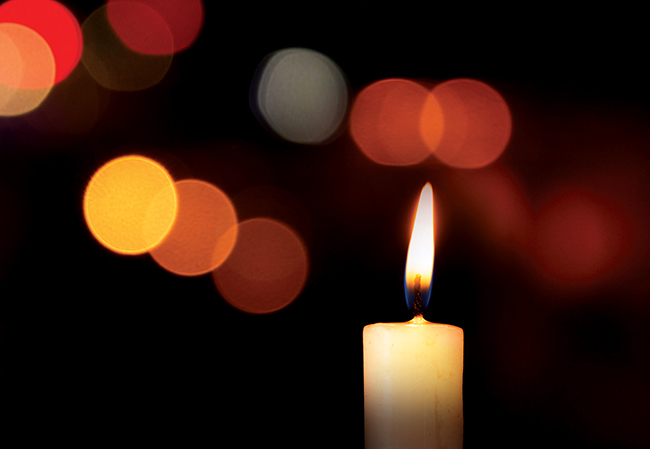 What’s more, certain candle wicks are made using heavy metals such as lead. These pollutants are also emitted into your living room upon burning. Not so relaxing now, eh? 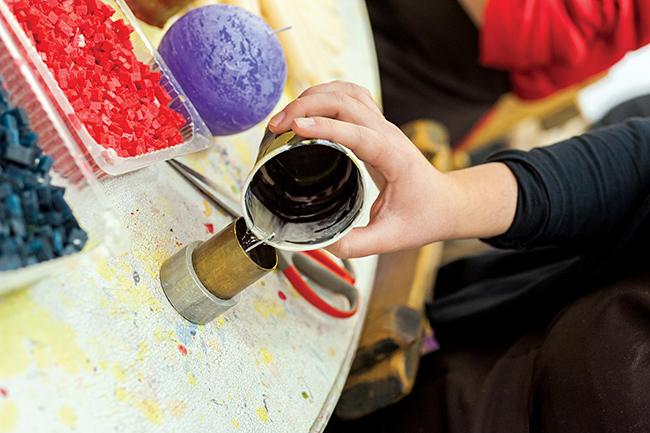 Luckily, making your own candles is pretty easy, and you can customise them with whatever colour and fragrance you like and mould into any shape you can imagine. You can use old jam jars, mason jars and old glass vases to create luxe candle vessels, which means you’re recycling with style without even trying. Soya wax: melts easily in a microwave, is renewable and environmentally sound when bought from an organic and sustainable supplier. Lasts 10%-15% longer than paraffin and is soft when set. Perfect for a beginner. Coconut wax: This wax gives a beautiful white colour and holds any added scents and colours well. It burns well and evenly and is suitable for use with most common wicks. Other vegetable waxes: These waxes are made from a variety of plants, but most frequently you’ll find hydrogenised rapeseed oil is used. This will produce a firmer wax, ideal for use in pillar candles. The larger the number attached to the wick’s name or description, the larger the wick size will be. 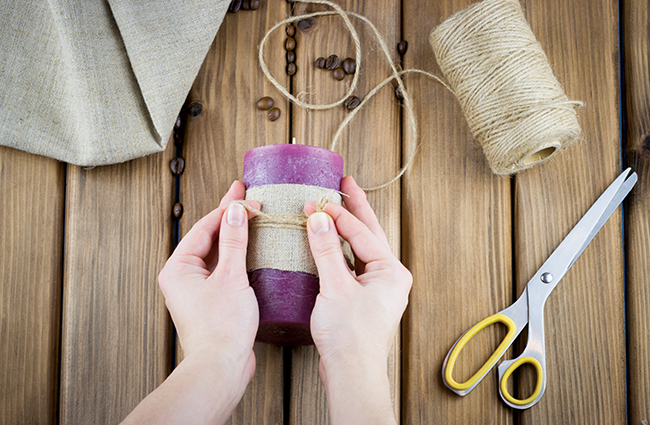 If creating a medium diameter candle, opt to use a medium-sized wick to begin with. Use this candle and wick as a trial candle. When the trial candle burns, you’ll need to pay attention to the flame size and the melt-pool that surrounds the flame. An overly large flame with carbon soot build-up on the wick, along with an overly large melt-pool, means your candle wick is too large and must be replaced for future candles of similar diameter. If your candle flame is too small or the melt-pool is not sufficient to extend to the outer regions of the container, your candle wick is too small and you need to use a larger one for the same size diameter of candle. Be aware that the addition of different colours and oils may affect the burn of your candle, so always be sure to run a few test candles prior to gifting away. Place your soya wax into your glass bowl and melt over a bain marie (or in the microwave for a faster recipe). You’ll want to melt the wax to around 70°C. Stir the wax occasionally whilst it’s melting. Wash and clean your containers, ensuring there are no foreign objects inside that may affect the clarity and the burn of your candle. Secure the wick at the bottom of your candle container. To do this, either use a small amount of glue, or dip the wick sustainer into the molten wax slightly. Place the wick in the centre of the candle container. Once secure and set, straighten the wick and ensure they stay central and in place by pinching two chopsticks or skewers between the wick. Secure the sticks to the candle vessel with tape. Once the wax has reached 70°C, remove from the heat/microwave and leave to cool to 65°C, or for around 5-10 minutes if you don’t have a thermometer. 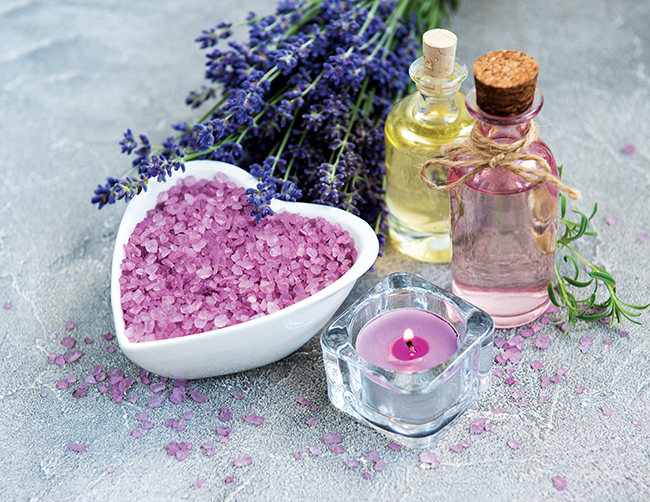 Add in a few drops (approximately 10-12) of essential oils such as rose, lemongrass or lavender. Stir to distribute evenly. A common occurrence during candle making is shrinkage and sinking of your wax away from the edges of the container and wick. But don’t panic – you’ll be able to fix this! 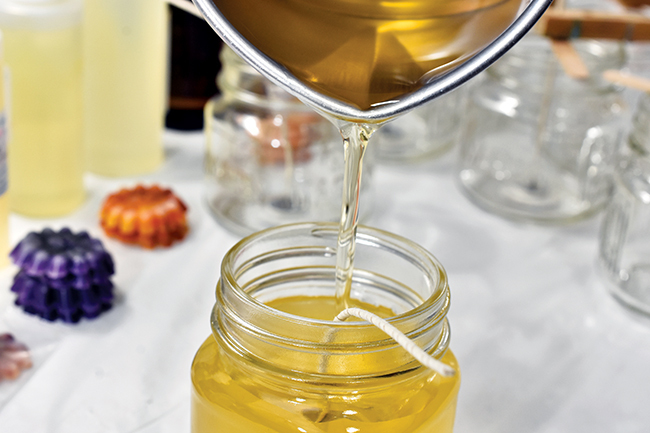 Simply let the container wax set, then re-melt any remaining wax you may have left over from the previous stage. Carefully pour the re-melted wax into the sinkages and cracks of your candle vessel. You may have to repeat this one or two times to ensure you get an even surface. Allow your candles to set and cure overnight and you’re done! If you’re giving them as a gift, tie with rustic twine or ribbon and place in a recycled box. 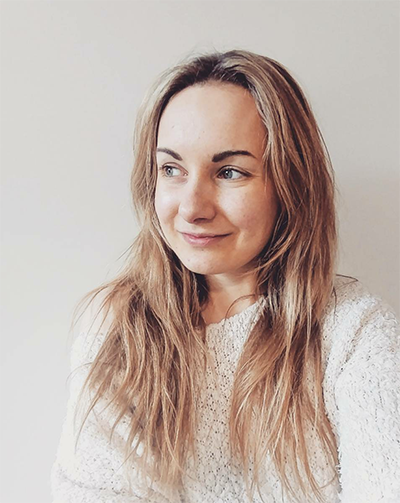 Charlotte Willis is a freelance journalist and health writer who has worked with the Vegan Society, Veganuary and other online vegan publications. Her fields of expertise and interests include vegan nutrition, holistic healthcare, mindfulness and fitness. She is currently researching and studying the links between food and psychological health while pursuing a doctorate degree in counselling.